EZ-DigiSigns are easier to set-up than most TV and DVD entertainment centers. The installation is a simple three step process. 1. Plug the display (LCD Screen) into the player. 2. Plug the player into the Internet. 3. 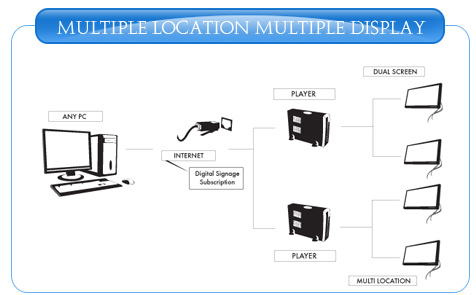 Start the digital signage rotation over the Internet. There are many display options with EZ-DigiSign digital signs. 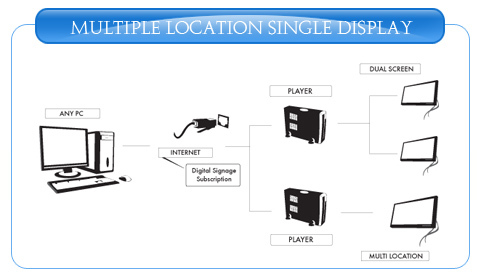 Single or multiple displays and single or multiple locations. All signs are controlled by one EZ-DigiSign subscription from any computer with an Internet connection. 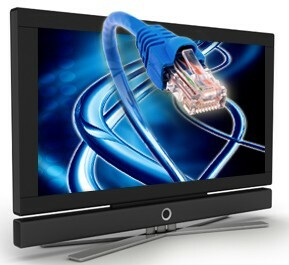 Digital signage displays are either computer monitors or flat screen displays. High definition LCD and plasma screens show crystal clear images perfect for digital signage. Displays may be wall mounted, placed on a table or counter, or mounted on a pedestal stand. A Player is a computer that is connected to the display. Virtually any "off the shelf" computer that can run an Internet browser will work, as EZ-DigiSign uses one of the several standard Web browsers to display digital signage. This computer will need to be connected to the Internet and can easily be configured to display full screen. The EZ-DigiSign monthly subscription service is the online management software that is accessed from any computer with an Internet connection. This service produces the content and manages signs display length and sequencing. This is where EZ-DigiSign really blows away the competition! Since EZ-DigiSign sequences and plays standard HTML web pages, the entire Internet is available as content. You can display entire pages or individual elements from virtually anywhere on the Internet. You can build your own pages using our powerful and easy to use EZ-PageBuilder or any software that will export HTML (example: Microsoft Word). You can also create signs using graphics software like Adobe PhotoShop, Corel Draw, Photo Impact or thousands of other software packages.